Helpful information from Stonebriar Home Inspections! Do-it-yourself home projects are sweeping the nation, and it’s easy to see why. DIY is typically budget-friendly and fulfilling to complete; simply find the right project to match your skill set and needs. To get started, here are five inexpensive projects that can be tackled by any DIYer, each of which will have an impact on the entire home. Replacing your kitchen cabinets changes the entire look of your kitchen — but it’s expensive and requires considerable skill. For a simpler, smaller project that can still have a big impact, replace the hardware on your cabinets instead. Select the hardware type first — knobs for doors and pulls for drawers, for example — then move on to style. Crisp, sleek hardware goes best with a modern kitchen, while more detailed offerings work well with classic, traditional kitchens. Repainting a wall or room is the perfect way to showcase your style, without breaking the bank. The Unity palette from Sherwin-Williams® 2018 Colormix Forecast offers unique color choices that pair together perfectly, making it easy for homeowners to create a cohesive look in their space. 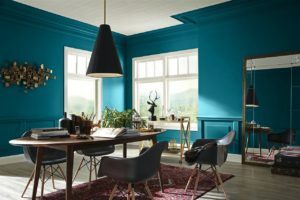 Try going bold with pops of a peacock on an accent wall, such as Sherwin-Williams 2018 Color of the Year, Oceanside SW 6496, or you use the palette’s grounded browns to put a new spin on traditional hues. It’s easy to recreate a space that reflects who you are, without making expensive renovations. It doesn’t always take a huge change to reinvent a room; it can be as easy as changing the light fixture. You could choose to repaint your existing chandelier, or you could give your ceiling fan a new look by replacing the blades. If you’re on the crafty side, try making your own shade for an existing lamp with some of your favorite fabric. Can’t decide on the one perfect image for your wall? Then why not go for several? Gallery walls are a great way to show your favorite prints and photos artistically. Pick the wall and apply a fresh coat of paint before building your gallery — after all, this wall will now be part of the exhibit. Once the wall is ready, pick your photos or prints and set them in frames you love. Now the fun part lay your works of art on an open floor space and rearrange them until you find the perfect layout. Once you’ve found it, grab your hammer and nails and bring your gallery wall to life.